After graduating from high school in Maribor, Marko Naberšnik took up studies at the Faculty of Economics. In 1996 he attended one semester at the New York Film Academy, where he shot his first short film The Beginning (Začetek). It was with this film that he passed the entrance exam and began studies of film and television directing at the Ljubljana Academy for Theatre, Radio, Film and Television (AGRFT). 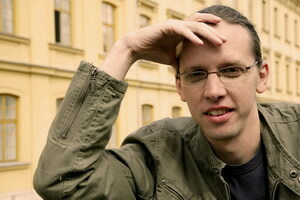 In 2000 his short film With Love (Z ljubeznijo) received the University Prešern's Award and his film Pavle was awarded Vesna, the award for the best student film at the 5th Film Festival in Portorož. Since 2002, when he graduated from the Film Academy in Ljubljana, Marko Naberšnik has been working as an assistant professor at the Academy, and as a director of films, documentary films and various TV shows. Rooster's Breakfast is his first full-length feature film.